Synopsis: Two Los Angeles homicide detectives are dispatched to a northern town where the sun doesn’t set to investigate the methodical murder of a local teen. 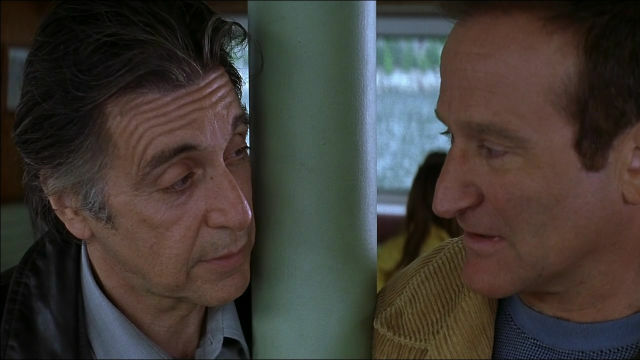 Christopher Nolan’s Insomnia almost makes an art-form out of ambiguity. It should be infuriating, frustrating, and in a way it is, but it’s also symptomatic of the world in which L.A. Police Detective Will Dormer (Al Pacino – Manglehorn, Danny Collins) finds himself soon after touching down in Nightmute, a remote Alaskan town which is in the midst of a period of endless daylight during which the sun never sets. He’s there with his partner, Hap (Martin Donovan – Agent Cody Banks, Ant-Man) to investigate the murder of a 17-year-old girl as a favour to local Police Chief Nyback (Paul Dooley – Shakes the Clown), whose own officers are clearly out of their depth. A misty morning stake-out turns messy when the suspect evades capture and Dormer shoots Hap dead in the confusion. Devastating as that turn of events is, it’s worsened by the fact that, the night before, Hap had revealed to Dormer that he was cutting a deal with Internal Affairs, who are in the midst of investigating Dormer over allegations that he falsified evidence in order to gain the conviction of a man he knew beyond doubt was guilty. He knows that the IA will believe Hap’s death wasn’t accidental – and, as lack of sleep takes its toll, Dormer also begins to question his own actions immediately before his partner’s death. Accidental or not, Dormer’s guilt over the incident makes worse the insomnia that has plagued him since before his arrival in Nightmute, and will deprive him of any sleep at all for the next five days. By the time he hit his 60s, Pacino looked exhausted even when he wasn’t, so it isn’t much of a stretch for him to convince us he’s experiencing the hell of sleep deprivation in Insomnia. His skin is drawn and sallow, a patchwork map of lines; his eyelids hang like weights over his eyes, and his jaw is slack. Dormer functions, but barely. Although he cannot sleep, he endures the stuff of nightmare, stumbling over sharp rocks or slippery logs in pursuit of a quarry he can’t catch. One nightmare ends with his partner’s death, the second very nearly with his own, and the link between impermanent and endless sleep is repeated through to Insomnia’s final scene. The investigation into Hap’s shooting is carried out by young cop, Ellie Burr, a devotee of Dormer who studied his cases in college, and is played by Hilary Swank. The double-Academy Award winning actress does what she can with a thankless, one-dimensional role, but must be inwardly seething over appearing in a movie which delves so deeply into the minds of its leading male characters while giving her nothing more to do than look pretty in a police uniform. Anyway, Burr is conscientious enough not to allow her admiration of Dormer to interfere with her duties, and appreciates the encouragement offered by the detective, who even goes so far as advising her to re-check her report when she’s ready to hand it in. Meanwhile, he’s busy falsifying evidence once more in an attempt to pin Hap’s murder on the man they were pursuing that day. Dormer has the gun the killer dropped in his haste to get away, and, after retrieving a bullet he fires into the body of a dead dog, switches it for the one plucked from Hap’s body before it’s sent to ballistics. He then hides the gun in the cabin of local pulp writer Walter Finch (Robin Williams – Shakes the Clown), whom he has by now deduced is the man they’re looking for. He’s free and clear – until, that is, he receives a call from Finch in which the killer reveals he saw Dormer shoot Hap, and wants to cut a deal – I won’t tell about you, if you don’t tell about me. In Will Dormer we have the most confused and confusing of heroes who finds, in Walter Finch, a kind of dark twin, a man whose only crimes until he killed a seventeen-year-old girl had been written in his pulp detective novels. Finch says the girl died, but he didn’t intend to kill her. It wasn’t murder, but an accident. He’s lucid and plausible, and although Dormer doesn’t believe him for a minute, we can’t help but question the sleep-deprived policeman’s judgement. Dormer’s a cop, but he’s abused his position in order to do wrong – even if it was for the right reasons. The boundary between right and wrong, like that between wakefulness and sleep, has become blurred almost beyond recognition. Unfortunately, the moral and psychological conundrums in Insomnia which make for such intriguing viewing are punctuated by obligatory – and largely unnecessary – action scenes which feel as if they’ve been included as a sop to studio executives. Even Finch, who makes a complex, intelligent, and unsettlingly creepy villain thanks to Williams subduing his manic side, reverts to standard Hollywood bad guy tactics in a disappointingly by-the-numbers final confrontation. Insomnia is probably Christopher Nolan’s weakest feature to date, but it’s still far better than most Hollywood thrillers. Click below for a free preview of the Kindle book, The Films of Christopher Nolan. The book, written by the author of this review, features reviews of all of the actor’s films, and is available to buy, or to read for free if you’re a member of Kindle Unlimited. You don’t need a Kindle reader – Amazon’s Kindle app works on most popular devices and can be downloaded for free from their site.